Added on February 13, 2018 by M Bltte. Welcome to the fourth interview of the 2018 Delaware Fun-A-Day Event - and first by new DEFAD organizer Sheila Sunshine! She talked to Lvon Yoder about his DEFAD projects, how he wants to "Spread positive energy always", and his penchant for bold color. Thanks, Lvon! We like to know how people are connected to Delaware - are you a resident, born and raised? I am a resident of Delaware, born and raised in Newark, Delaware. I've lived in DE my entire life. This will be your second year participating in Delaware Fun-A-Day. For anyone that missed it, can you describe last year’s project? Any artists you are hoping to see participate again? My project last year consisted of printer paper cut in half, then I used markers, crayons and pen along with recycled books and magazines. Basically they were mixed media collages. There's a few artists I'm hoping to see participate again, who knows. Your last project focused on drawing and collage, but you typically work with paint. Do your drawings inform your paintings, or do you keep the two mediums separate? Such a good question. I would say I keep the two separate. Last year was a first time- showing my collages and drawings. 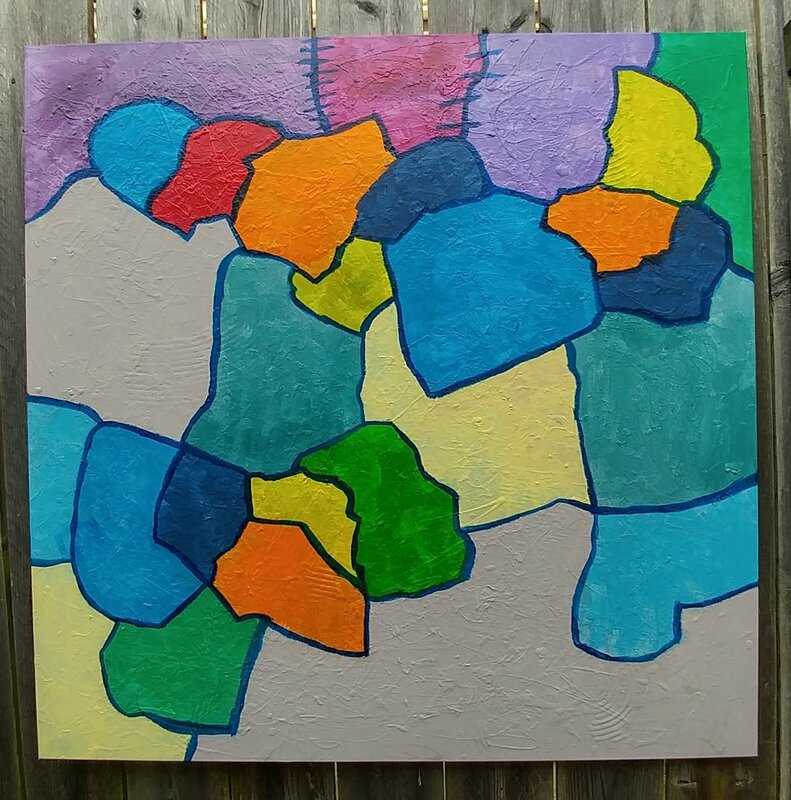 Your abstract paintings commonly feature bold, bright colors. Where does the inspiration for those come from? The inspiration for my color choices would be artists such as Roy Lichtenstein and Man Ray. Artists who choose the most bold colors. There are so many textures and techniques you achieve on the canvas. Which one is your favorite? What is your process like? My process is somewhat meticulous and partly random, also I experiment with different colors. You regularly share other artists’ work on your social media channels. (For instance: The Obama's portrait reveal, a painting by Spherical Art, urban sketches by Wild Plein and Joan Coromina) Do you feel it’s important to build and support a community of artists? How do you choose what to share? I share what I like and find interesting. Yes, I feel its very important to support other artists and help them find opportunities when I can. I'll usually share someone's art once I meet them and get to know a little about them. Elise Kathleen & Dave Booth are some favorites. You sell your work in a way that supports quite a few charities and causes. What is your favorite way to give back? What are your favorite charities and why? I do work with a few charities, any way I can help especially if it's art involved. I've donated images and the proceeds go to charity. My favorites are HealingHeadbands who helps children in hospitals with cancer. Do you have any advice for people who might be participating for the first time? My advice would be to enjoy yourself, listen to what people have to say. More importantly don't stop making art. What 5 things have influenced your work the most? This years project: I may do the collages once again, not sure yet. I'm sure it will have bold color no matter what.